All the prophets of God including; Adam, Noah, Abraham, Issac, Jacob, and the tribes, Jesus, and Muhammad (peace be upon them), invited the people to the same thing, to worship The One God without any partners, son or associates. Verily all praise is due to Allaah. We praise Him, we seek His Help and ask for His Forgiveness. We seek refuge in Allaah from all the evils in our souls and from our sinful deeds. Whoever Allaah guides, no one can mislead and whoever Allaah leaves stray, no one can guide. I bear witness that there is no one worthy of worship except Allaah. He is one and has no partners. And I bear witness that Muhammad is His servant and last Messenger. O believers have fear and consciousness of Allaah according to His right and die not except as Muslims. O mankind, have fear and consciousness of your Lord, the One who created you from one soul and created from it its mate and from them spread many men and women. And fear Allaah from whom you demand your mutual rights and do not cut off family relations. Surely Allaah is Ever an All-Watcher over you. O believers, have fear and consciousness of Allaah and always speak the truth. He will direct you to do righteous deeds and will forgive you your sins. Whosoever obeys Allaah and His Messenger has indeed achieved a great reward. 1) We must not name or attribute anything to Allah except with what Allah or His Messenger has named or attributed to Him. 2) None can be named or attributed with the Names or Attributes of Allaah. E.g. The Mighty (Al Azeez). 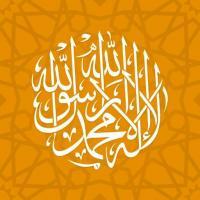 Laa illaaha illullaah is the foundation of Tawheed (Islamic Monotheism) and Islam. It is a complete system of life, through which, all forms of worship (of Allaah) are realized. That happens when a Muslim submits himself to Allah, and calls upon Him alone, and refers all issues (of right and wrong) to His Law, to the exclusion of all other systems of law. "The word ilah (i.e. God), means the One who is obeyed and not defied, out of one sense of awe and reference, love, fear, and hope, placing one’s trust in Him, asking Him and supplicating Him alone. Whoever directs any of these matters (which are the rights of Allaah) to a created being, has detract from the sincerity of his statement La ilaha illa- Allaah. And he has worshipped that created being to the extent he directed those matters toward it". The sincere person is the one who understand, acts according to its requirements, invites others to it, and gives it presidents over all other issues, because it is the concise formula of Tawheed (Islamic Monotheism) for which human beings are created. The statement 'Laa illaaha illullaah' will benefit the one who says it if he confirms to its meaning in his life, and doesn’t nullify it by associating partners with Allaah, such as supplicating to the dead or calling upon the living who are absent. In conclusion, it is from this understanding of Tawheed [Islamic Monotheism] that confirms what Muslims already know i.e. Islam is the only Monotheistic Religion and way of life in the universe. Therefore, we invite you to this understanding and we invite you to this way of life. All excerpts of the Qur’an are taken from the " Interpretation of the Meanings of the Noble Qur’an in the English Language" by Dr. Muhammad Muhsin Khan (Islamic University, Al Madina Al-Munawwara) and Dr. Muhammad Takiud-deen Al-Hilali (Islamic University, Al Madina Al-Munawwara) which is the most authentic translation of the Qur’an (according to the scholars of Islam) available in English today.